It�s unclear how much interest movie audiences have in the co-founder of Apple Computers, but filmmakers can�t resist him. 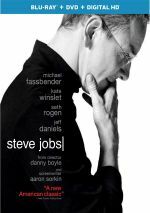 Released nearly simultaneously with Danny Boyle�s Steve Jobs, we find a documentary called Steve Jobs: The Man in the Machine. Narrated by writer/director Alex Gibney, Machine starts with the aftermath of Jobs� 2011 death and then goes back to look to the pre-Apple development of the computer. We learn of Jobs� interest in the subject matter and how he and Steve Wozniak developed their first machines. From there we trace additional developments in Jobs� career, mainly via ups and downs at Apple. We also get occasional nuggets about Jobs� personal life. As expected, Machine uses the genre�s typical format, as it melds archival materials with interviews. In terms of new chats, we hear from tech journalist Michael S. Malone, Atari co-founder Nolan Bushnell, high-tech marketing consultant Regis McKenna, former Time reporter Michael Moritz, MIT Initiative on Technology and the Self Director Sherry Turkle, Macintosh Director of Engineering Bob Belleville, friend/Apple technician Daniel Kottke, former girlfriend Chrisann Brennan, NeXT engineer/friend Michael Hawley, journalist Joe Nocera, Apple head of hardware Jon Rubinstein, Apple head of software Avie Tevanian, iPhone senior manager Andy Grignon, author Yukari Iwatani Kane, Fortune managing editor Andy Serwer, journalist Peter Elkind, Gawker co-founder Nick Denton, Deputy DA Chris Feasel and Gizmodo editors Jason Chen, Brian Lam and Jesus Diaz. We also get older comments from Jobs and Apple co-founder Steve Wozniak. Given how much has been said about Jobs, the question becomes what new Machine brings to the subject. The answer seems to be �not much�, but that doesn�t make it a bad documentary, especially for those who�ve not already gotten that information. As a primer, Machine works well at times, though it doesn�t follow as �A to Z� a path as I imply from my synopsis. While the movie goes in largely chronological order, it skips about a bit and lacks the natural �A happened and then B happened�� technique we expect from documentaries. I view that as good and bad. On the positive side, I appreciate the ambition of the narrative, as the traditional chronological take can get tedious. However, there�s usually a strong reason that a traditional approach becomes traditional: because it works. If a program deviates from that format, it needs a good reason. Boyle�s Jobs boasts an unusual path that succeeds, but I�m less convinced the somewhat unfocused Machine does its subject justice. At times, it can be difficult to tell what story Machine wants to tell, as it dilly-dallies with various sides of its subject. One minute we learn basics about computer issues and then we flit to Jobs� spiritual side and then over to his personality. Do all of these topics connect? Yes, but Machine doesn�t link them especially well. If a natural through-line exists, it doesn�t seem apparent to me, as the shifts and changes feel nearly random. Which is a shame, as the movie comes with a lot of good information, especially in terms of its archival materials. We see a wealth of interesting footage from Job�s life/career, and those moments add to the experience. The scattershot nature of the project remains a turn-off, though, as it lacks coherence. It simply takes on too many topics in too random a manner. We go from technological developments to Jobs� personal life to his spiritual life to corporate business to scandals to Apple�s impact on society to monomaniacal tendencies, etc. Any one of those topics could make for a good documentary, but bundled all together, they feel slapdash and insubstantial. All of this leaves Machine as a frustrating documentary. It includes some good material but it comes across as so incoherent that it turns into a mess. 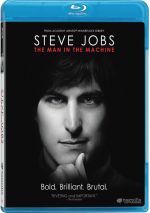 Steve Jobs: The Man in the Machine appears in an aspect ratio of approximately 1.78:1 on this Blu-ray Disc. Given the nature of the production, the picture quality seemed pretty positive. I mostly didn�t factor the archival material not shot explicitly for Machine into my grade. Those elements demonstrated all sorts of flaws, but it didn�t seem fair to criticize the Blu-ray for problems with that kind of stuff. As for the new shots, they presented solid sharpness. These elements consistently looked crisp and detailed, and they betrayed few signs of softness. Those bits portrayed no problems with jagged edges or shimmering, and I saw no edge haloes or source flaws. Not surprisingly, the disc�s palette tended toward natural tones. The movie�s hues came across with positive clarity and definition. The colors always looked vivid and concise, and I noticed no problems with them at any times. Blacks also seemed deep and firm, while the occasional low-light shots appeared well defined and clean. Overall, I found the image to seem satisfying for this sort of flick. Given the film�s focus, I expected little from the DTS-HD MA 5.1 soundtrack of Machine, and the track indeed seemed limited. Of course, the dialogue remained the focus, as the majority of the film�s information came from interviews or other conversational bits. However, the program offered good stereo imaging for music throughout the film, as it presented near-constant use of songs and score. A few effects also crept in from the sides and surrounds, but not much occurred. The music spread to the back as well, but the front speakers remained the focus, and speech was firmly centered. Audio quality seemed fine. Speech was consistently crisp and concise, with no issues connected to edginess or intelligibility not caused by poor source materials. Music seemed well-reproduced and clear. Effects were minor but acceptably accurate. This was a low-key track that worked fine for the material. 11 Deleted Scenes fill a total of 31 minutes, 13 seconds. Across these, we get comments from NYU professor Clay Shirky, writer/researcher Evgeny Morozov, Free Software Foundation founder Richard Stallman, Director of Macintosh Engineering (1982-85) Bob Belleville, friend/Apple technician (1977-84) Daniel Kottke, journalist Jeff Jarvis, Fortune managing editor (2006-14) Andy Serwer, iPhone Senior Manager (2005-07) Andy Grignon, and friend/NeXT engineer Michael Hawley. Like the film itself, the deleted scenes jump all over the place and vary in quality. A few good stories appear, but most of the material seems pretty superfluous. An Interview with Director Alex Gibney goes for nine minutes, 55 seconds. Gibney discusses what led him to the subject, the film�s construction, interviews, thoughts about Jobs, the movie�s reception and his hopes for it. Gibney mainly seems to promote Machine, so he doesn�t offer many insights. The disc opens with ads for Experimenter, The Lady in the Car With Glasses and a Gun, Synchronicity and Drunk, Stoned, Brilliant, Dead: The Story of the National Lampoon. We also get a trailer for Machine. At times, Steve Jobs: The Man in the Machine brings us informative moments. However, it suffers from a severe lack of focus that makes it frustrating. The Blu-ray comes with mostly good picture and audio as well as minor supplements. Machine lacks the consistency to succeed.